Snow sisters is author Kerri Kokias' lovely debut picture book. This book opens with a simple reaction by two sisters: Snow! and Snow. From then on, words fall gently like snowflakes. The snowy day provides a canvass for painting two sisters' unique personalities and illustrator Teagan White makes excellent use of it. This book also had a playfulness between the words and the illustrations that makes it more than the sum of its parts. The two are well combined for a fresh and fun story. This is a great book to cuddle up with your kids on a snowy day. While inside for a warm up, you could also make the snowball cookies featured in the book. 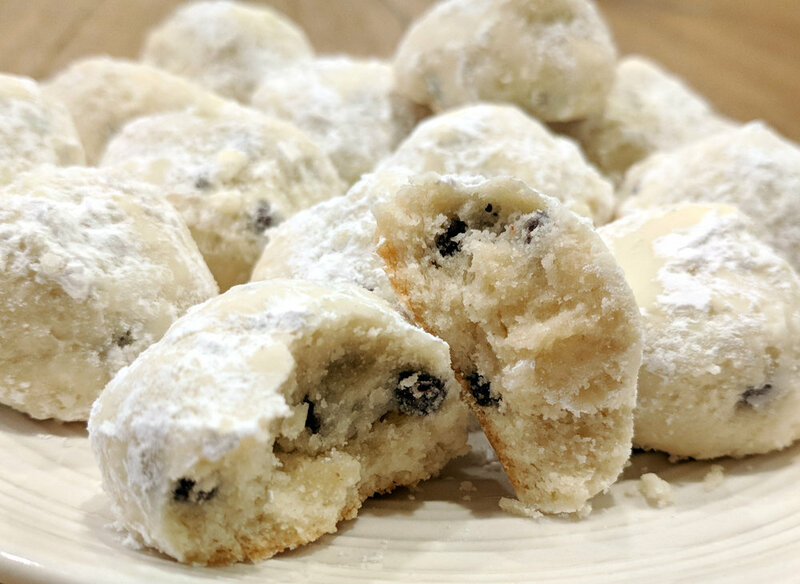 Now snowball cookies are traditionally made with nuts, but my family is a no-nut household. Here's a nut free version. Beat softened butter and powdered sugar together until smooth and creamy. Add the flour slowly until well combined. Form the dough into tablespoon-sized balls and drop on ungreased cookie sheet. Bake for 7-10 minutes or until the bottoms are lightly browned. Removed from oven and let cool until they can be handled (about a minute). Roll the cookies in the extra powdered sugar. Let them cool completely and then ENJOY! Yum! This recipe makes about 16 cookies (enough to fill one large cookie sheet). It's a smaller recipe, so it won't feed a crowd. But it's just enough to satisfy a sweet tooth and then refuel before heading out to play outside some more. This book and snack pairing will make for a delicious and cozy snowy day.